When Lauren Perry pulls on the green, yellow and white Tasmanian skinsuit at the Anna Meares Velodrome, February 1-4, it will be the first time in three years she has competed at the Australian Track National Championships. A dual junior world champion on the track, Perry tasted success in her first season elite, in 2014 winning the Australian scratch race title as well as Oceania and World Cup gold. "I'm so stoked to be racing Track Nationals again, it has felt like an eternity since my last championships. Most of all I am here to set benchmarks for myself so that I can look to improve on that throughout the year," Perry said a day out from competition. "I am also hoping for a good result in the scratch race as it's one of my favourite races." The second half of 2015 and 2016 were challenging for Perry as she battled fatigue, which saw her lose her motivation to train. A forced break from the sport saw Perry find her love of two wheels again and take a new approach to the sport. That of enjoying riding her bike and not focusing only on the goal of selection or a medal. With International Track Series Melbourne in July, Oceania Championships in November and Australian Omnium and Madison Nationals in December, Perry's return was going full steam. 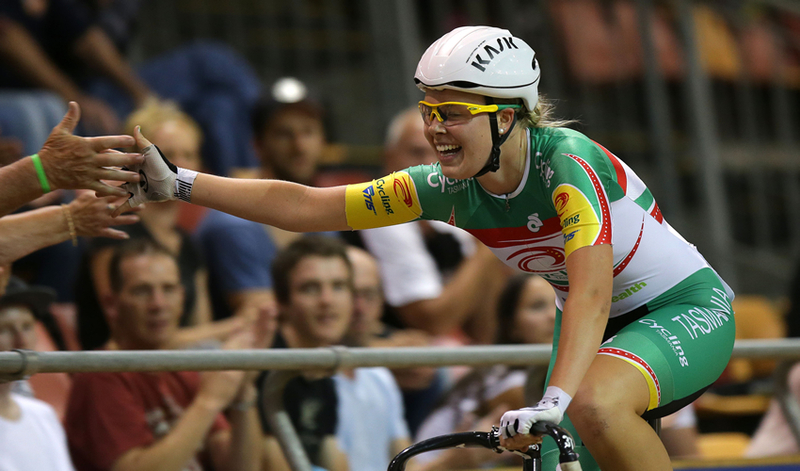 Wins in the Latrobe Women's Wheelrace and the Mixed Madison in Launceston at the Tasmanian Christmas Carnivals reinforced the view that Perry was back and on the up. "I was really happy I found some form at the beginning of the Tassie Christmas Carnivals. It's been a long time since I've been able to stand on the top step of the podium and it really gave me confidence that I am making progress," Perry said. A day later Perry fell ill having come down with appendicitis, resulting in surgery and an end to her Tasmanian Carnivals and put her participation in Track Nationals in doubt. "At the time I was worried I wouldn't make the National Championships but I listened to my body and when I felt I was able to, began ergo sessions and I slowly got back out on the road and track too. "I was really unsure how my form would be coming in to Track Nats with less than ideal preparation but I'll work with what I've got, and to be honest I really don't think I lost too much fitness." Part of a small but always strong Tasmanian line-up, joining Perry is Olympian's Georgia Baker and Amy Cure with the trio all posing a threat in the women's endurance events. "I have no doubt that team Tasmania will put their best foot forward this week. We may have a small team, but it won't stop anyone getting big results," Perry added. While feeling good ahead of racing Perry is taking a long term approach with Track Nationals an important stepping stone as she returns to racing at this level. "Long term, this week is just about continuing to improve and doing the best I can. It's another stepping stone on the way to something greater and I know I'll come out of this week having learnt new things that I can use to move forward. "I do have big goals for the future, but right now I'm focussed on the pathway to get there."